This lesson introduces tools and concepts that are essential for scenario-based planning for sea level change. The lesson guides the learner through the use of the USACE Sea Level Change Calculator to produce site-specific water-level projections. The lesson also introduces the NOAA Sea Level Rise Viewer and NOAA's Sea Level Trends website. 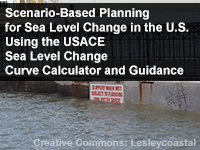 Identify the two main USACE guidance documents and the USACE Sea Level Change Curve Calculator and their function. Describe the main concepts from the two main USACE guidance documents, such as the scenario approach, future non-stationarity, thresholds, and adaptation horizon. Describe how the Calculator supports the concepts in the guidance documents and the types of information that it can and cannot provide. Use the Calculator and NOAA and USACE sea level change projections to produce site-specific water-level projections.